In this post, I would like to explain Part 2 - How to fetch data from the database using angularjs in MVC4 application. This is our second Post about AngularJS. Here I have explained a little about AngularJS and What we will learn in this section part by part. In Part1 of this post we configured AngularJS in MVC4 application. 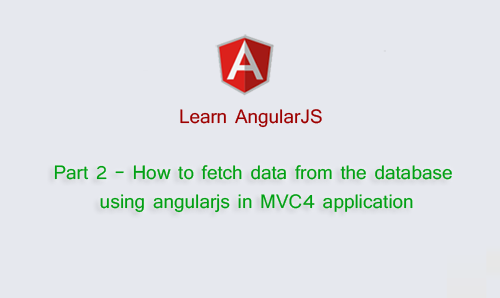 In this part (Part 2) I am going to explain how to fetch data from the database using angularjs in MVC4 application. Here In this example I will use AngularJS $http service. $http is an AngularJS service for reading data from remote servers. Step-2: Create table into the database. Step-3: Add Entity Data Model. Here I have created a controller "DataController"
Step-5: Add new action into your controller for fetch data from Database and return as JsonResult. Here I have created an angular controller named "Part2Controller" and a Factory named "ContactService" with $http injected service. I have explained a little about AngularJS controller here. Factory : We can use factory to organize and share code across our app. Its moreover same like Service Layer of our asp.net application, where we write reusable code for share across our application. $http : $http is an AngularJS service for reading data from remote servers. This support gives us the ability to make requests back and forth from a server or multiple servers, which is essential to a client-side app like ours that needs to get and set data. The $http service is a core AngularJS service that helps faciliate communication with remote HTTP servers via the XMLHttpRequest object or through JSONP. Step-7: Add new action into your controller for Get the View for show data from database. Right Click on Action Method (here right click on form action) > Add View... > Enter View Name > Select View Engine (Razor) > Add.